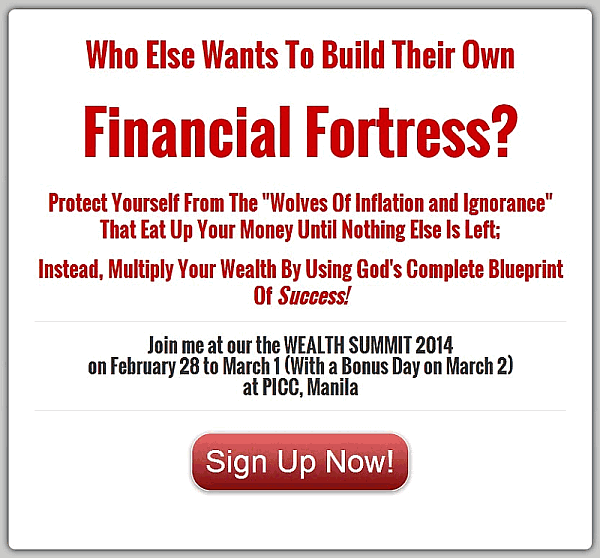 Bo Sanchez’ Wealth Summit 2014 will be happening this coming February 28, 2014 to March 2, 2014 (Friday-Saturday-Sunday), at the PICC, Manila. This year’s 2-day Wealth Summit (plus 1 “bonus” day) will be about building your Financial Fortress where you will get 14 Blueprints for Success. Don’t forget to use the 10% discount code below. It’s quite an honor and privilege for me to be one of the speakers, although I have to admit I’m more excited with learning from the others. Just look at the awesome lineup below and you’ll know what I mean. I’m also glad some of the other speakers are mentors and friends of mine, which include Jomar Hilario (I started this blog after I attended one of his workshops-this time he’ll be talking about his “Super VA blueprint”), Maves Angeles and Randy Manaloto (Real Estate), Paolo Abadesco (Online entrepreneur), Larry Gamboa and Sha Nacino (“Money Out Of Thin Air Blueprint”), and Ivy Dela Cruz (Ivy will be speaking during the bonus day about network marketing). Check out the complete lineup of speakers and topics in the Wealth Summit 2014 below. 1. What does it take to reach the TOP of your field? Learn the “Over-The-Top Performance Blueprint” from Comedy Queen Ai-ai delas Alas. How did she become one of the highest paid Actresses in the country today? You’ll hear her incredible journey to incredible success. (It wasn’t easy!) You’ll be inspired to take on this mindset of a Superstar. 2. How do you DEFEAT financial mediocrity forever? Get “God’s Complete Blueprint of Success” From Bo Sanchez (Founder, TrulyRichClub). After Bo’s presentation, you can now follow the same patterns of financial success that ALL multimillionaires practice. Start a financial revolution in your life! 3. How do you FIGHT Giants? Learn the “Faith For Success Blueprint” by Cecilio Kwok Pedro, Chairman of Lamoiyan Corporation, makers of Hapee Toothpaste, which now is exported to Russia, Middle East, Papua New Guinea, Vietnam, and Hong Kong. Learn the strategies he used to compete with huge industries! Be inspired by his faith. 4. How can you DIFFERENTIATE yourself towards success? Learn the “Magic Of Uniqueness Blueprint” for your business or product from Johnlu Koa, Chairman and Owner of French Baker. Learn how he grew his business from a small bakery to 45 branches in the country today. Get insights on how you can differentiate your business too. 5. 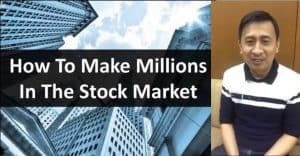 Do you want to WIN in the Stock Market? Edward Lee, Chairman of the Board of COLFinancial,often called the “Warren Buffet of the Philippines” (because he has been winning in the Stock Market for the past 35 years) will teach you the “Turtle Always Wins Blueprint”. PLUS listen to his private thoughts on where the Stock Market is going and how you should respond to gain from it. 6. Do you want to WIN as a Stock Market TRADER? For the very first time, Edmund Lee, Founder of the Caylum Trading Institute, will share how “Rabbits Can Win Too Blueprint”. Edmund was raised up by his father Edward to be a Trader since he was a child; In the WEALTH SUMMIT 2014, he will share the stage with his father to explain the trading side of the Stock Market. 7. How can you experience a BREAKTHROUGH in your job or business? You’ll be super blessed when you learn the “World Class Mindset Blueprint” from none other than Rex Mendoza, CEO and President of Philam—and one of the most dynamic speakers in the country today. Learn the winning strategies of Financial Abundance for your job, your business, and your life! 8. How do you create BIG wealth from small wealth? Get the “Multiplication Principle Blueprint” from Joen de las Peñas and Noel Arandilla (Founders, International Marketing Group). From these two financial mentors, you’ll learn that it doesn’t take a millionaire to become a multimillionaire. 9. Is It Really Possible To Earn By Selling Your Ideas via a Blog and eBooks? Listen to Real-Estate Guru Larry Gamboa on how he created a second income stream by becoming a “Wisdom Giver” as Author, Speaker, Seminar-Organizer, Coach, Online Course Giver. You’ll also be inspired by Sha Nacino, author of 7 eBooks, and Aileen Santos, Relationship Coach, who will share their own “Money Out Of Thin Air Blueprint” You too can create cash out of your ideas! 10. Is Real Estate Riches For You? Learn how Randy Manaloto, owner of Citydorms, and Maves Angeles, owner of Happy Homes Reality, will talk about “Real Estate Riches Blueprint”. Maves will share her moving story—from someone living in the slums for 9 years, this young woman is now a property developer. 11. Do you want to build an Online Store that sells stuff? Paolo Abadesco, the computer genius responsible for building Bo Sanchez’ online businesses, will share with you the “Online Business Empire Blueprint”. He’ll reveal to you the newest and most effective tools to build your own online business empire at the lowest cost. Whether you’re selling “soft” stuff like information or “hard” stuff like Tee-shirts and gadgets. Listen also to Marco Victoria of how he built a shoe business from scratch. 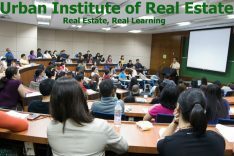 Listen also how Jay Castillo of Foreclosure Philippines grows his real estate business via the internet. 12. How Can You Earn In Dollars While Living In The Philippines? Internet Marketing Guru Jomar Hilario will teach you the latest wisdom for his “Super Virtual Assistant Blueprint” and how you can work from home and enjoy real time freedom. 13. What does it take to be a Serial Entrepreneur? Learn from Dean Pax Lapid, the professor who starts one business a year—and at such amazing speed, who will speak on “Create Your Army Of Businesses Blueprint” Teaching with him are serial entrepreneurs, Ronnie Siasoyco, Founder of Trion, and Junie Toreja, owner of Toreja Corp.
14. How you can receive God’s Favor For Building A Financial Fortress? NOTE: More Special Surprise Guests will appear during the TrulyRichClub WEALTH SUMMIT 2014! Real businesses will be showcased as examples for YOU to follow and imitate. Do you want to be a Super Top-Selling Salesperson? No sales, no income. If you want to be an entrepreneur, you’ve got to know how to sell. Join the exclusive group who will attend the BONUS DAY on March 2, Bo Sanchez and Jojo Apolowill discuss How To Become A Super Top-Selling Salesperson. If you’re in sales, and want to DOUBLE your sales records this year, this day is especially designed for you. Jojo Apolo is the Director of Sales of the largest food corporation in Indonesia. Through the use of simple neuro-linguistic “human technology”, he has been able to raise the company’s sales every year. 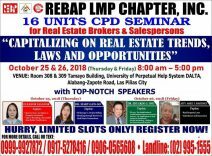 Special “Super Salespersons” such as Charlie Fernando, Owner of Clixlogic, the multi-millionaire repairman; PLUS Network Marketing Superstars, such as Butch Mercado of Royale, Ivy De La Cruz of Usana, and Benjie and Fely Santiago of International Marketing Group. Be inspired as they share their struggles and victories in this “controversial” business. From your notes, identify actionable items/tasks. When you are organizing your notes, you will have to restructure them and create something like a “to-do list”. Attending events like these are useless if you don’t take action afterwards, so writing your action items is a must! From the huge list of things you should do, prioritize and schedule them. Arrange your tasks accordingly and schedule at least 1 task a day, or a week, or a month, depending on how busy you are, and how difficult that task maybe. Commit yourself and just do it! You will never have any results until you take action, so go for it! Rinse and repeat! Measure your results by actually going back to your list and reviewing what you did and what happened, then keep moving forward towards your goals! We look forward to seeing you at the Wealth Summit 2014!